Amherst, MA: NextChar LLC, based out of Amherst, MA has formed a partnership with Greenfield-based Martin Farms to create a superior organic compost blend for farmers, gardeners, and landscapers. 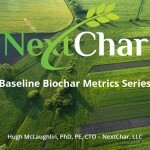 Martin Farms is both selling pure, OMRI certified biochar from NextChar, as well as adding NextChar’s high-quality, porous biochar to their compost. It is a perfect marriage; the compost provides nutrients to the soil, while the biochar helps hold those nutrients, as well as moisture, in the soil for the plant roots to access. The future of compost is with biochar; it makes sense economically, and environmentally. This partnership with Martin Farms and NextChar is the beginning of an exciting trend for farmers, gardeners, and landscapers.